We’d love your help. Let us know what’s wrong with this preview of Immortal Black Dragons by Nina R. Schluntz. Zackariah created an Enukara back when they were being made every day, and murdered hours later. Despite the odds, he managed to keep his alive long enough to understand how compassionate humans can be. Decades later, he meets his Enukara's son, Jonas, and finds that he is now an Enukara. Zackariah must decide if he will tell him the truth behind his mother's death, even i Zackariah created an Enukara back when they were being made every day, and murdered hours later. Despite the odds, he managed to keep his alive long enough to understand how compassionate humans can be. Decades later, he meets his Enukara's son, Jonas, and finds that he is now an Enukara. Zackariah must decide if he will tell him the truth behind his mother's death, even if it risks the relationship forming between them. 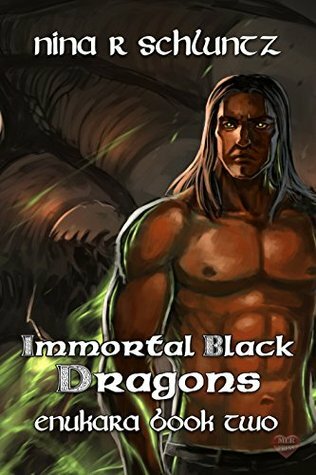 To ask other readers questions about Immortal Black Dragons, please sign up. I like that the author went back and we got to see what happened all those years ago but we barely move forward with a new story from book one. I hope the next book will go forward and not back. I live in America with my husband and our Kitty, a rescued Abyssinian. I have four novels currently out of print that have been re-released as an abridged novella. They are a prequel to my science fiction novels, the Decompose Series: Amaranthine, Aurum, and Nacreous. My romance novels are published by ManLoveRomance Press and always have a happy ending. Kale's Paroxysm and Not a Big Deal. I also h I live in America with my husband and our Kitty, a rescued Abyssinian. My romance novels are published by ManLoveRomance Press and always have a happy ending. Kale's Paroxysm and Not a Big Deal. I also have a short story in the "Hope for Pulse" anthology. Nosy Neighbors, is my first paranormal romance and due out soon is my first book in a romance series about shape-shifting dragons, Enukara. I grew up on a quiet farm in Nebraska. I’m an avid movie goer, so most of my blog posts will be a review of the most recent movie I happened to see. Sometimes I’ll mix it up and read a book too. Or… my favorite, I’ll see the movie then read the book it was based on!